Joyous feast! Today we celebrate the memory of the Roman centurion who witnessed the Crucifixion of our Lord and recognized that "truly this was the Son of God!" 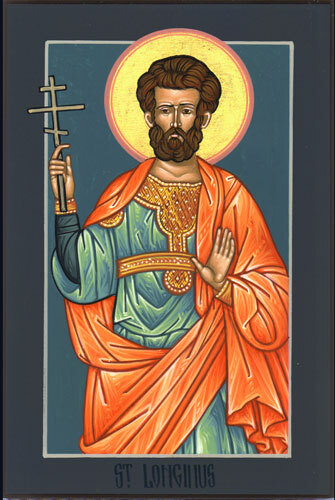 St. Longinus (often shortened to Longin) is remembered by the Tradition to be the Roman soldier who pierced the Lord's side with a spear, bringing forth water and the divine blood and being healed by the flow from a disease afflicting his eyes. After the Lord's burial St. Longinus and his company were assigned to stand watch by the Tomb and thus became some of the first witnesses of the glorious Resurrection. Although most of the company were bribed by the Jews to deny what they had seen, the Saint and two of his fellow soldiers refused to take the money and received baptism from the Apostles. After being baptized St. Longinus left the military and Palestine to preach the Gospel of the Son of God in his homeland, Cappadocia. Christianity spread quickly wherever the centurion and his two companions preached in Cappadocia. In time the three were martyred for their faith, being beheaded by their former comrades. More on the life of St. Longinus can be found here. May his blessing and prayers be with us all!